NetNewsWire is an RSS reader for iPhone. It allows its users to download their feeds to their mobile devices and read them even in the offline mode ( this can be done only when feeds are downloaded ). What i really like about this app is its syncing features for once you read an article on your iPhone, it will be automatically marked as read in other platforms because NetNewsWire syncs with Google Reader and NewsGator. It allows you to read news from the millions of weblogs and sites that publish RSS feeds. You can email articles or post links to Twitter to share with friends. It is compatible with iPhone, iPod touch, and iPad and requires iOS 3.1.3 or later. How can i get started using NetNewsWire ? That’s it about NetNewsWire – Download and read Feeds on the go. Read It Later is another cool mobile app. It allows its users to save web pages to read later even without internet connection. I have already talked about the web version of this app and showed you how you can use read It later on your computer to save everything that interest you online to check it later ( read Read It Later: a great web tool for educators). today i will be presenting the mobile version of this tool. It syncs all your accounts meaning that when you save an article at home you can still read it on your mobile device. Read It Later even remembers where you left off in every article and helps you pick up the right line you were reading last time you accessed the page. All of your read articles are archived so you can quickly dig up anything you read in the past! It is compatible with iPhone, iPod touch, and iPad. Requires iOS 3.1 or later. How can i get started using Read It Later ? Here is a short video tutorial to show you how you can use Read it later to save and read pages. Thar’s it about Read It Later – save pages to read offline on your mobile. Big Marker is a social networking tool. It allows its users to not only create free and unlimited web conferences but also to host them with friends , family, and colleagues. It lets you choose between creating a public room that anyone can access or a private room locked with a password that you can share with your students. It lest you share your screen , text and audio chat. Big Marker is a great tool for educators , they can use it to conduct online conferences, tutorials, and lessons.You can create private groups for your students and start sharing and even live chatting with them to help them through what they are learning. Students working on collaborative projects can also use it to brainstorm ideas and notes to finalize their works. If you liked this tool then you can check other free social networking tools. Reqall is a great mobile app for educators. It enables its users to recall whatever they have planned to do instantly and easily. Be it a urgent report, a call to a friend , a project at school , a task to do at home , Reqall gathers and manages them all for you to remember by voice , text, email, IM, and many more. Reqall is in fact one of the best task management apps that we can use with our students to note important dates for quizzes, meetings, and tasks.In this hectic world of us , the human mind is limited and we just canot keep on with all that is going on and that’s why Reqall has been created just to help you remember everything and at the right time and all for free. It lets you know what you need to do at that time and at that location. It Save your ideas, to-do lists and things to remember by voice or text. Or use email, IM, and more. How can i get started using Reqall ? That’s it about Reqall – free personal reminder mobile app. Simplenote is a cool mobile app for educators. It allows its users ( as its name suggests ) to easily and simply take notes. It is in fact one of the best note taking mobile apps available online for free. I highly recommend you to try it and see by yourself. Beside keeping notes, lists,and ideas Simplenote automatically synchronizes with your computer and all your devices. Simplenote is very easy to use and does not require any tech wizardry to handle it. After you sign up, try making some notes then log on to simplenoteapp.com, amazingly enough, all your notes will appear there and any changes you make will synchronize back and forth automatically. Simplenote is free but there is also a premium version with added features. Remember, this app is Compatible with iPhone, iPod touch, and iPad and requires iOS 3.1.3 or later. How can i get started using Simplenote ? That’s it about Simplenote – note taking mobile app. Zite is an awesome mobile app for educators. It “ gives you personalized news, articles, blogs, videos and other content from a variety of both mainstream and niche publications and sites”. Zite resembles Feedly , the other mobile app we have covered in an earlier post, for they both aggregate newsfeeds and deliver them to you in such an easy and beautifully customized way. Zite attempts to customize and deliver the type of articles you like to read in a newspaper style reading.It is Wifi- connection enabled which means that you can easily access news content with a tap of a button. As educators , we can try Zite to make our reading experience even better. You can access the content of your favorite websites and even customize it in a newspaper style and share it with others. Invite your students to use it and enjoy the look they would have when reading the feeds of the websites they like. I am quite sure you will like this app when you try it. It allows you to share content you like to Twitter, Facebook and via e-mail. It is compatible with iPad and requires iOS 3.2 or later. How can i get started using Zite ? That’s it about Zite – personalized magazine for your mobile. Feedly is a cool mobile app. It allows its users to get the latest updates of their favorite blogs and websites right into their iPhone and iPads. If you are already an existing Google Reader user then this is your” faster and more visual overlay with lots for sharing options and seamless 2-way integration”. Do not worry if you do not use Google Reader , you still can enjoy Feedly. By default the app features news feeds from a long list of popular sites including the BBC, Engadget, Perez Hilton. For me i look at Feedly as a learning app and i want you to use it this way , we are educators after all. It is powered by Google Reader, Twitter, Instapaper and Read it later. It is compatible with iPhone, iPod touch, and iPad. How does Feedly works ? That’s it about Feedly – keep updated on the go. Imageoid is a free photo customization tool. We all love photo tools and we feel great when we can control what we can see in a picture. Imageoid is a service that enables you to tweak your photo just the way you like it to look. It offers a variety of effects that you can add to your images making them look like they are created by you. I still remember how you loved interacted with the other photo tool i have already covered here under the title: Convert to Cartoon ; turn your pictures into cartoons ... . and today i am presenting to you Imageoid hoping that you will like it too. With imageoid , educators can prepare their pictures very easily and customize them so that students will feel the teachers touch in them. It is very simple to use and you do not need to be a technology wizard to do it. All you need is a browser and an internet connection. How can i get started using Imageoid ? You can combine different effects into one image and if you are not satisfied with the final result then you can simply click on ‘ reset’ to start over again. If you liked this photo tool and thought it would help you in your multimedia projects for your classroom then do not hesitate to give a try , it might help. I love PDF is a great tool for educators. We all love portable document format files for they are easy to read and do not drain our eyes as other formats do. Today i am introducing you to I Love PDF which is a free service that allows its users to either merge several PDF files into one or split them. This tool is very easy to use and does not require any download or installation software. Everything is done online and it takes only a few clicks to get your PDFs both merged and split. How can istart using I Love PDF ? Remember The download link is available for 15 minutes. 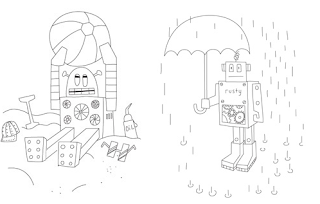 If you like this post then you can check other awesome PDF tools together with their tutorials. My Vocabulary.com is a free resource site for teachers. It offers a plethora of vocabulary lessons, wordlists, and puzzles created solely for the middle school and high school students. My Vocabulary.com is “used in over 24,000 schools to enhance vocabulary mastery & written/verbal skills with Latin & Greek roots”. This website is very useful for teachers especially language teachers. They can use it to develop students’ mastery of vocabulary. Students can have access to different wordlists and word puzzles. There are also many other activities and assignments that can all if used properly enhance not only students’ repertoire of vocabulary but their writing skills as well. Edmodo is one of the greatest educational web tools and mobile apps that has ever been created. Some of you might have already heard of it but if not then this is your chance to learn about it. Edmodo is a “free and secure social learning network for teachers, students and schools. It offers a real time platform to exchange ideas”. It is one of the best means of teacher-student communication. Edmodo allows students and teachers to stay connected via sending notes , replying to postes, and checking messages and upcoming events while being away from the classroom. It is now a universal application that is available both in web and mobile format. In short , Edomod is a micro- blogging platform adapted for educational purposes. It is built around closed group collaboration which means that only students with a password can access or join your group. As i said earlier Edomod is also available for mobiles like iPhone, iPod touch, and iPad. Head over to iTunes app store to download Edmodo app , it is free. How can i get started using Edomodo ? Educators can do several things with Edomodo. They can use it as a communicative tool with their students. They might create a closed group for all the students in a class and start sharing homework, assignment, tasks, notes , messages and many more. They can also use it to create online resources for their learners , these resources can be anything like web pages , documents or power points. Show Me is a free mobile app. It allows its users to create interactive whiteboard-like lessons on your iPad. It also allows you to record voice-over whiteboard tutorials and share them online with your friends or colleagues. Show Me has already started a special page dedicated to support teachers via a gallery of lessons created by educators and each day there is a Show Me of The Day that is added to this gallery. It has a directory of great tutorials created by Show Me community. How can i get started using Show Me ? ShowMe iPad App from San Kim on Vimeo. 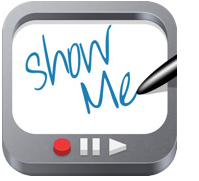 Educators can use Show Me app in various ways. They can use it to easily explain a range of topics from math to chemistry to music theory. They can also use it to Grade student work with commentary explaining the reasoning behind their performance. Show Me can also be use to deliver short and concise lessons to students or even get them to share these lessons between each others. Markup.io is a free web tool for educators. It allows its users to quickly write and draw on any webpage. It acts like the other bookmarking tools we have talked about here but with an extra plus that is easy page annotations. 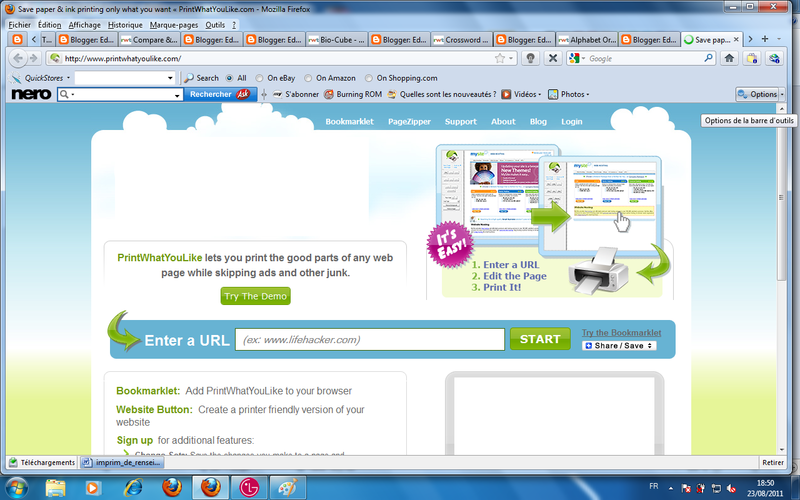 It has a bookmarklet that you can install on your browser toolbar to make your bookmarking easier. It is very simple , just install the bookmarklet on your browser and whenever you are on a page that you want to edit and share then you click on the bookmarklet and you can start drawing and commenting on that page. when you are done you click on publish and a screen capture will be displayed with its unique URL that you can point others to. That’s it about Markup.io – Annotate and share web pages easily. Minutes.io is a great web tool for teachers. It is a free and simple service for recording minutes during a meeting and share them right away. I really like how this tool works and i am quite sure you will like it too. You do not need to be a tech wizard to use it , it even does not necessitate an internet connection because your drafts are saved on your browser and when connectivity is there then you can send them. How can i get started using Minutes.io? Here is a short video tutorial to show you how to use this note taking tool. Minutes.io is a great tool for educators. They can use it to take notes while attending symposiums and conferences. They can also use it to share content with each other or with their students. As for students , they can use it in group works and collaborative assignments to do and and track their tasks. 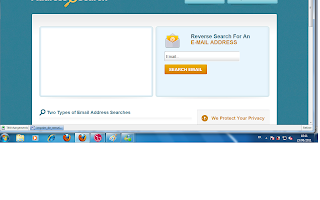 Address Search is a great service offered for free. It allows its users to reconnect with their former friends, colleagues, classmates or/ and relatives. This service enables you to find out email addresses of the people you are interested in. 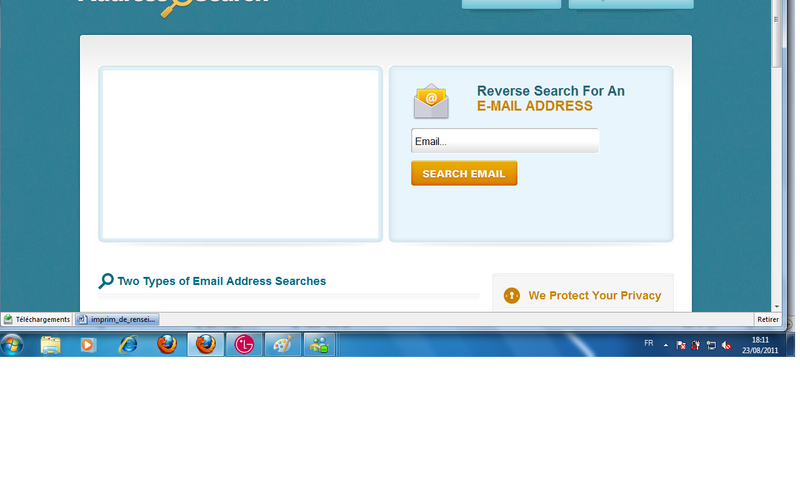 It is kind of email directory with millions or even billions of email addresses indexed and stored in their data base. When you are looking for someone’s email address , Address Search checks their email directory for possible matches and then compare those matches with their telephone directory increasing , thus , the chances to find the right email of the right person. You can also find other identifiable information about them like their face book profiles, blogs or websites. While we make this service available for free, we do partially hide the email address in the results we provide, allowing the searcher to email the address using a contact form. No access to the actual email is ever given. This is done in an effort to protect the privacy of the email address’ owner, while providing them with a way to be contacted by someone looking for them. How does Address Search work ? 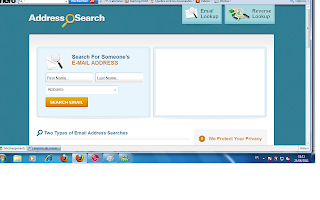 There are two ways to use to find email address information about someone using Address Search. 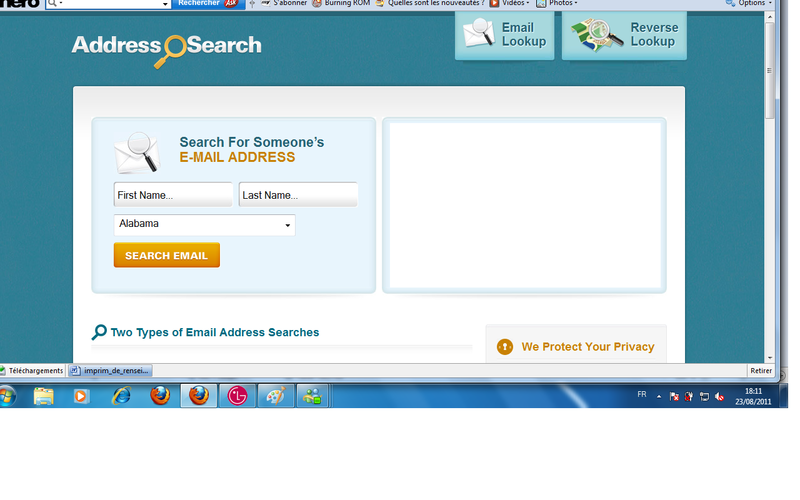 This type of search is conducted when someone is using a name to get an email address. This is very helpful when trying to reconnect with an old friend or classmate whom you know nothing about for a long time. This kind of search is very helpful when you try to find out the owner of an email address and his name. This is a good way to validate the identity of a sender or ensure you have the correct email address before you send out an email. Remember the results are not always accurate but if you are a US citizen then chances are you might get better results then others. That’s it about Address Search – Reconnect with old friends and classmates. Mr. Printables is a great resource for educators looking for printable flashcards , games, puzzles, coloring pages, calendars and many more. Mr. Printables is a useful educational tool for kids, teachers, and parents. It provides a huge selection of flashcards covering various learning topics such as mathematics, drawing, the alphabets, basic vocabulary ,shapes, scrapbooking, planners, geometry, numbers , words , and more. 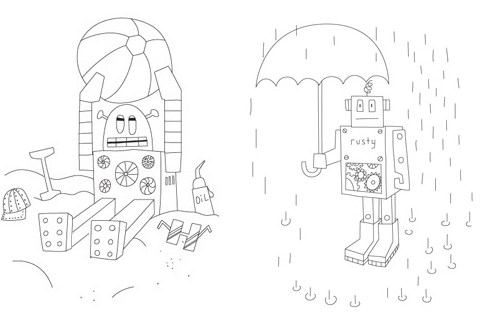 All these resources are free to use for a personal non commercial use. They are available as PDFs that you can download very easily. Why using flashcards in learning/ teaching after all ? They boost students’ self- esteem, motivation and achievement especially in early life. These are in brief some of the pluses behind the use of flashcards in the classroom with students. Now head over to Mr. Printables and select the materials you would like to include in your future lessons; if you do not want to use them yourself then at least inform students’ parents of these materials and let them use some with their kids. That’s it about Mr. Printables - Free k-12 flashcards and graphic organizers. Juice Defender is a free mobile app for educators. It manages and controls power consumption on your mobile device. In fact one the drawbacks of the continuous dependence on mobile phones is the battery power savings. How many times you are caught in the middle of somewhere say a trip or a long travel and your battery is going dead on you? I hate it because it happened to me more than once especially when i had to travel back and forth from Canada to Morocco which normally takes me 24 hours. Now with Juice Defender the problem is probably solved , i say probably because i have just installed it on my phone and i am going to see if it really works as they say but i am hoping it does. 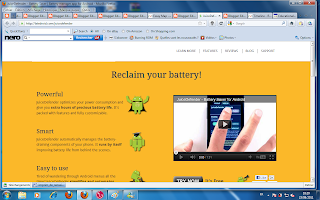 Juice Defender is mainly an Android app that is free but premium versions are also available. How can i get started using Juice defender ? watch this video tutorial to learn how to use it. 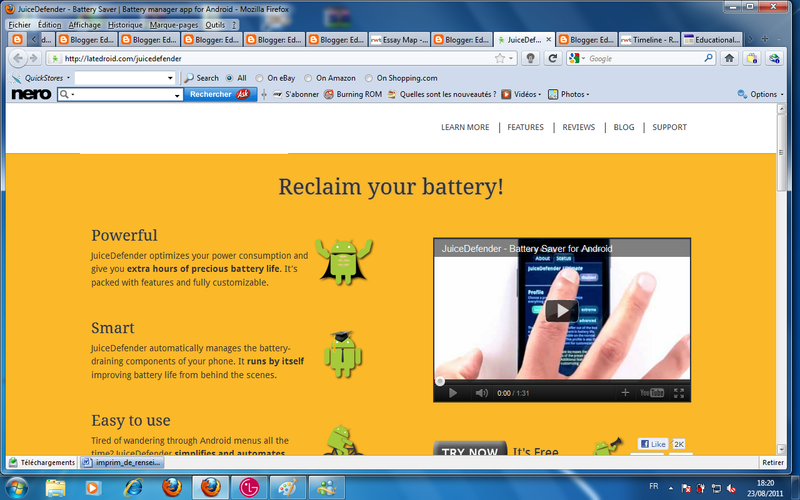 That’s it about Juice Defender – a mobile app to extend battery life. Essay Map is a free interactive graphic organizer. It is designed with the aim of improving students’ writing skills. It is like a graphic outline that features the main stages for writing an essay. It has a part for the introduction, and one for developing ideas and the last one for conclusion. I like how this graphic sheet is organized for it saves you time to get your ideas organized and gives you an esthetic boost that your moral needs to produce a good piece of writing.The finished map can be saved, e-mailed, or printed. how can i get started using Essay Map ? Essay Map is a great tool for improving students’ writing skills. It will help students develop an outline that contains introductory statement, main body with featured ideas and supporting details, and conclusive notes that summarize the whole gist of the essay. Students’ writing style will be organized and much more refined. If you have not tried this interactive graphic organizer then i strongly advise you to give it a try , you will love it for sure. Best of luck. How can i get started using Timeline ? Both teachers and students can use Timeline to organize their notes into a sequence of time that they can navigate at the instant of a click. They can also use it to brainstorm the main stages of a process especially in biology and chemistry. For language teachers Timeline can be useful in organizing the English tenses into an axe of time easily understandable by students. 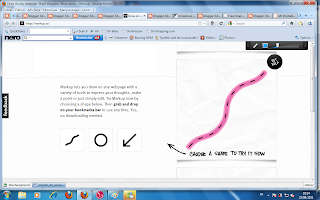 The Graphic Map is another free graphic organizer. This tool can be found and used for free in Read Write Think. Graphic Map as its name suggests is designed to help students and teachers in their writing and reading activities. It works according to an evaluative system that charts the high and low points related to a certain item or group of items like : chapters in a book , sums of money, events during a span of time, scenes in a play. The Graphic Map creates a graphic representation of the above mentioned elements and even categorize them in such a way that students can easily navigate the information allowing them to move around the map without having to work in a linear fashion. How can i get started using The Graphic Map ? Graphic Map is a very important tool that students and teachers can use in their classrooms. For example it can be used as a prewriting activity with students mapping ideas for an autobiography or giving clues in group work for others to base their writings. They can also use it as a post reading task “as students map the significance of events in a story; and as a reflection and assessment activity, as students map the high and low points of their inquiry process”. ReadWrite Think Notetaker is a graphic organizer offered for free by Read Write Think. It is mainly a hierarchical outlining tool which allows students to organize their information into up to five levels. This is indeed a great organizational tool that educators can use to take notes on their readings and research. It can also be used to plan, revise and organize writings. On finishing working on your writing , Notetaker creates an HTML file that you can print, save or edit later in any HTML editor. How can i get started using Notetateker ? Notetaker is an organizational tool that students can use both in their reading and writing activities.For example , if students are preparing a project work or a classroom presentation they can use it to assemble ideas sort them out and organize their final notes. They can also use it as a prewriting tool to organize their information and review what should and should not be included in the last draft. The Webbing Tool is a free-form graphic organizer and a flowcharting tool that allows “ students to pursue hypersexual thinking and writing”. It is my favorite organizer as it is easy to use and does not require any kind of sin up or download. Just drag your ideas around in the organizer to arrange any layout and relationship that you want . You can trace out options and rearrange connections. You can use both the circle or box shapes with different colors on each layer. There is a help button at the top of the page to help you understand how to use this graphic organizer. How can i get started using The Webbing Tool ? 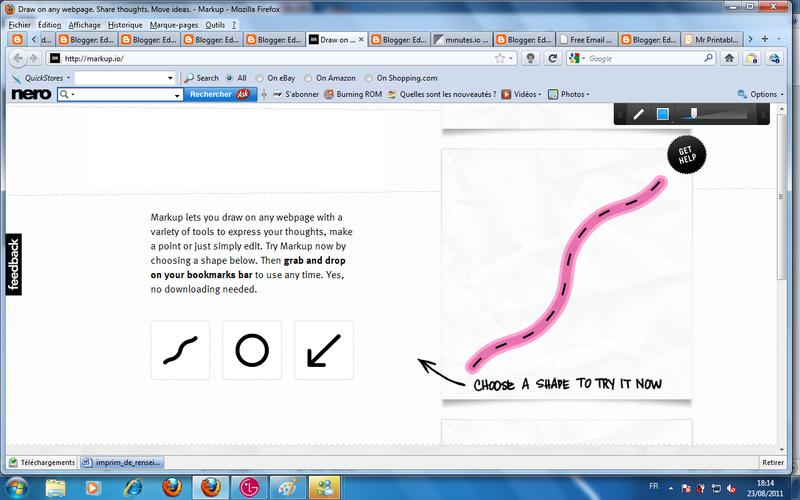 Students will like the Webbing Tool as it will help them outline their ideas in such appealing graphic representations. They can use it to analyze the reading passages they have in the curriculum. They can also use it as a prewriting task to brainstorm all the ideas and notes they want to include in their writing. The Story Map is a free set of graphic organizers designed to help teachers and students in prewriting and post reading activities. It contains four key elements of the story together with their graphic representations mainly : Character Map, Conflict Map, Resolution Map, and Setting Map. They all make it easy for students to both create their own stories based on a solid and coherent story line or simply revise the major events and characters in a story. At the end of each work , Story Map gives you the ability to print out the final version for feedback and assessment. How can i get started using The Story Map ? Students can use the four key elements of the Story Map to develop multiple characters either in preparation for writing their own pieces of fiction or as a reflection tool to analyze the characters from stories they have read. You can think of many other ways to integrate this free graphic organizer into your classroom teaching just don’t forget to drop us a line here if you have new ideas. The Plot Diagram is a free graphic organizer offered for free by our great resource Read Write Think. This tool is mainly an organizational tool which is shaped like a triangle or better say a pyramid. It is used to map the events of a story in literature work . It clearly demonstrates in a graphic way the main features of the plot structure like the beginning, climax and end. Of course we can use The Plot Diagram to organize any kind of info be it literary or any other things. How can i get started using The Plot Diagram ? Elementary and higher students will be happy to see this graphic organizer. It will definitely help them structure reading passages in novels and other literary productions. I wish i had this tool way back when i was in the university , we had to do all manually but now the graphic representation of the plot structure has made it completely clear even for the blind to see how the story is structured. It can be used both as a prewriting activity prompting students to constitute a coherent story out of a given plot or as a post reading task as students fill in the triangle with info about the story stages. 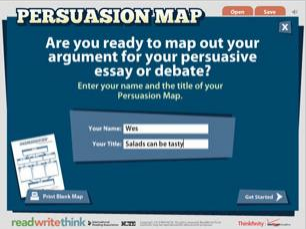 The Persuasion Map is a great graphic organizer offered for free by Read Write Think. It allows students to map out their arguments for a persuasive or argumentative piece of writing. I really like the way this map is built for it takes into consideration the gradual development of ideas and will walk students through a step by step process of building a solid argumentative statement or thesis. The Persuasion Map starts with a thesis that describes one side of an arguable viewpoint and then moves on to state the main reasons that would convince someone of the validity of your thesis before it ends up with a conclusion that summarize the arguments mentioned in the essay. How can i get started using Persuasion Map ? Persuasion Map can help students build their argumentative essays in such a persuasive way that the flow of their ideas would sound so much natural .The aim is to foster and develop students writing skills. We want them to master the art of writing argumentative essays where they can be able to argue a thesis and convince the reader of their ideas and Persuasion Map can help in achieving this goal. Compare and Contrast map is a great interactive graphic organizer. It is offered for free from Read Write Think to whom i channel my deep gratitude for their fantastic resources. Compare and Contrast Map, as its name suggests, is a tool that allows students to draw their differences and similarities about anything they want , be it characters in a text , political system of countries , or simply state what they like and dislike about a lesson plan. What i like the most about this tool is that it lets you share the finalized work with your students or friends using email options which was not the case with some of the graphic tools i talked about here earlier and that offer just the printing options. How can i get started using Compare and Contrast ? That’s it about Compare and Contrast Map – Free Graphic Organizer. 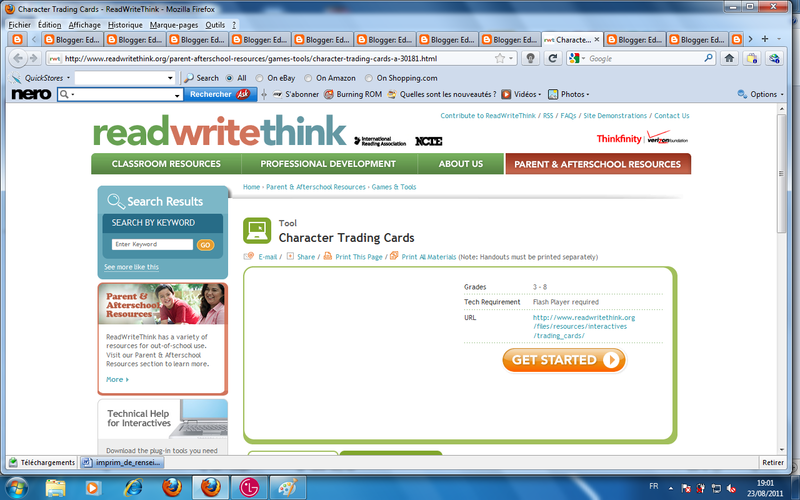 Character Trading Cards is another great education tool that educators can use with their students for free. 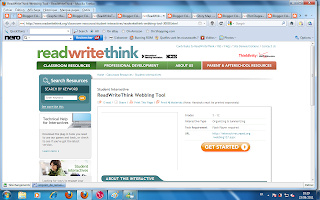 It is thanks to Read Write Think that we have these awesome collection of creative tools at our hands. 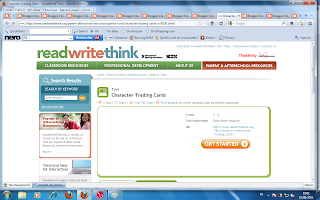 Character Trading Cards is a tool that allows students to explore a character in a book and organize info around it into a beautiful outline. Students will love it so much i am sure for it is very easy to use and offers some already premade backgrounds for you to fill in. How can i get started using Character Trading Card ? what is the most important things the character says ? What is the character’s most important action ? How does the character get along with other characters ? What do you like most about this character ? What do you dislike most about this Character ? Who does this character remind you of and why ? After you have answered and filled all the requested forms then you can press on print to get your printout . Character Trading Cards is a very important tool in education. It can be used for reading activities, students read a short passage then they try to fill in the characters info using this handy tool to demonstrate their literacy knowledge and skills . It can also be used as a prewriting activity or with narrative stories. Students hold out their character cards and prompt others to write a story about them or they can use it to play guessing games. It is so much fun for students . 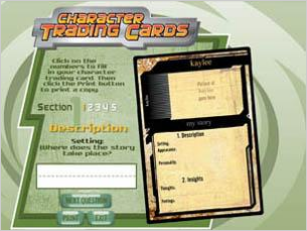 That’s it about Character Trading Cards – Explore and Create Characters Easily. 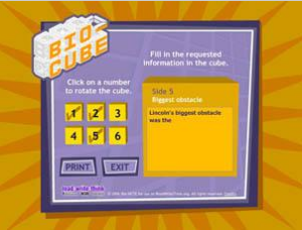 Bio Cube is another educational tool that is offered for free by Read Write Think. It allows students to summarize a person’s biography into a neat and well organized sort of outline. It has an intuitive interface where info are organized into different categories. The final printout you get after you are done with customization can be folded into a fun cube shape that can be used for future reference. How can i get started using Bio Cube ? Bio Cube is extremely important in education. It can have several uses and the first one of them is to allow students to make interesting autobiographies about persons they study. They can also use it as a pre-reading or pre-writing activity to brainstorm ideas about a certain figure. Students can also use it to write their own autobiography and share cubes with each other. With Bio Cube students will be able to effectively synthesize what they have learnt. That’s it about Bio Cube: Summarize a person’s biography easily. Cross Word Puzzles is a great tool for educators that is again offered for free by Read Write Think. I really love this tool for it allows you to make interesting puzzles very easily and at the instance of a click. Hey !!! you do not need to be a technology or math wizard to start using it. It is very simple to use and all it takes is filling up the boxes. I still remember years ago when i wanted to create a synonyms puzzle it took me almost five hours to come up with the columns, grids, clues and words and now i can do the same work in 15 mints , you see how technology is changing our life for the BEST. click on finish and you will have your finalized crossword at your hand for printing. The tool also includes a Play mode with crossword puzzles for students in grades K–12. Included with each puzzle are a For Teachers page with troubleshooting help and ideas for use as well as a Tips & Hints page designed to scaffold students' learning and help them do the research necessary to solve the puzzle. Crossword puzzles is a great tool for educators. It will help them improve their students’ thinking powers. Students can use it to revise their content area like vocabulary and grammar. I would really recommend it for you if you are a language teacher , students will benefit a lot from it and by the end of the year they will have memorized a huge number of vocabulary items just by playing Crossword puzzle.If you are teaching elementary or higher students then you can let them use it to create their own puzzles and share it with their colleagues. It can be so much fun while learning is taking place smoothly. That’s it about Cross Word Puzzles – create puzzles easily. Alphabet Organizer is a great tool offered for free by Read Write Think website. It allows its users to sort out words or list of terms using the alphabetical order. You can organize items under a specific letter or even go further than that to create an alphabet book with words for each letter of the alphabet. This interactive tool enables students to print an alphabet chart or pages for an alphabet book. How can i get started using Alphabet Organizer ? Alphabet Organizer is a great educational tool. It has several applications for classroom teaching. Learners can use it to learn about new words , they can also use it to create sort of little dictionary like notebook where to gather all the new words they have seen during the school year and then share them with each other. Elementary and higher students can use it for brainstorming and discussion of background knowledge about a topic. That’s it about Alphabet Organize – Organize and Summarize Alphabetically. Print What You Like is a free online editor that lets you format any web page for printing. You can now control what you want to print and avoid printouts that are full of ads and empty space. How many times we want to print an article but we end up having so many printouts that have nothing else but junk ? . As educators, we can use this handy tool to crop what we want from a webpage or even merge two pages into one before printing and sharing with students. 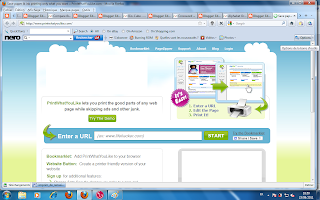 Print What You Like is browser based and does not require any installation or download. It is really one of the great PDF tools educators should be aware of. It removes ads and other junk you don't want. How can i get started using Print What You Like ? That’s it about Print What You Like – Control what you Print. Reversi is another free mobile gaming app. I am adding it to The Educational Mobile Gaming Apps i am collecting here in this blog. Reversi is a strategy game play on a board with 8 rows and 8 columns.The player’s purpose is to have a majority of their colored pieces showing at the end of the game, turning over as many of their opponent’s pieces as possible. This game is a real brain trainer and involves so much thinking. The original name of this game was Othello but because of copyright issues it became Reversi. How can i get started playing Reversi ? That’s it about Reversi – an entertaining mobile game.